A rolling code transmitter is helpful for providing a highly secured encrypted RF (radio frequency) and also its more helpful in security systems. An encrypted RF transmission comprising the interleaved rolling code and trinary bit fixed code. A receiver decode the encrypted RF transmission and validate the fixed code by rolling code recovery. Upon comparing both fixed and rolling code with stored codes and determining the signal has emanated from the authorized transmitter, a signal is generated to actuate an electric motor to open or close a movable component. A Remote controls send code via signal through RF. So receiver will receive the code and check whether the code is the same which is expected and then it will actuate the relay to open the device or a door. Remote controls with the fixed code will always send the same code so that the code will not change when we are triggering every time , But the remote controls with rolling code will always send out the random code at every time of triggering and also it will not send the same code or duplicate code which is already sent. 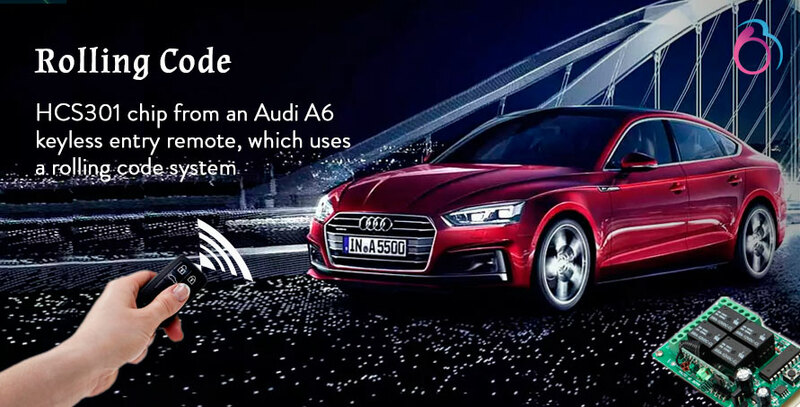 Right now in current vechile market Audi A6 uses the key less remote control by using this rolling code system chip HCS301. HCS301 key system transmits the 66 data bits and it was used by a garage system and gated remote control , receivers. 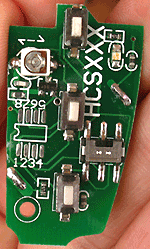 HCS301 chip uses the KeeLoq algorithm.